From the Baldwin County Courthouse, go east on Hancock St. and follow Highway 22 (Sparta Hwy) east for 1.1 miles. Turn right on Kings Road. Follow Kings Rd. for 2.5 miles until Stembridge Road intersects. Turn right on Stembridge Rd. Go 0.3 mile to 243 Stembridge Rd (the 4th driveway). The 3 graves are on the right, approximately 1000 feet (333 yards) from the road and on the left front side of the house. Located on Baldwin County Tax Map #092-021E. 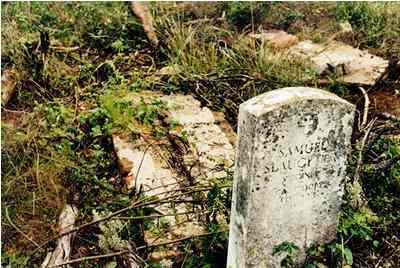 2 graves found in 1998. No longer visible in 2005.